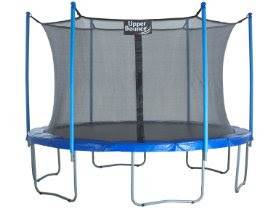 Today (1/10) only get this Upper Bounce 12-Foot Trampoline with Enclosure Set for only $269.99 (Retail $451.99)! Shipping is just $5 on this deal! Bring the best outdoor fun to your family with an Upper Bounce trampoline. Featuring a powder-coated steel frame for durability and hours of bouncing fun, Upper Bounce outdoor trampolines are fun for all ages 3 and up. Equipped with the new "Upper Bounce Easy Assemble Feature"